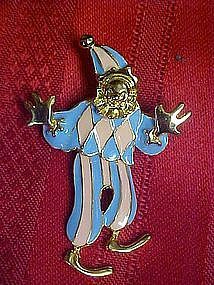 This has got to be one of the cutest circus clown pins I have seen! It swings from the middle. Pin measures 2 1/4" total height. Pretty pink and blue enamel decoration on a goldtone heavy metal construction. Just like new!